Welcome to the Free Recipe of the Month! Don't forget the Free Recipe of the Month changes each onth so be sure to get it while it's fresh from the oven! I always intended to make this recipe, found in my mom’s recipe box and finally did and had great a results! It always seemed easy, unique and delicious and it ended up being just that. She also made this recipe with apples but this berry version is just right for spring or summer. 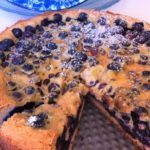 It uses a special cookie crust that is filled with a simple mix of blueberries, eggs and sugar and it all bakes up into a totally unique cake/pastry that no one can pass up. For the Crust, in a mixer bowl, hand mix the butter, sugar, eggs, vanilla, flour, baking powder and salt. Pat crust into a 10 inch spring form pan or a deep 9 inch quiche pan. Dough should go up the sides and make sure corners are not too thick with dough, i.e. even it out as best you can. In a large bowl, toss the blueberries gently with the sugar, cornstarch, flour, lemon juice and cinnamon. Spoon into crust. Place pan on baking sheet. Bake one hour or until crust is browned around edges and berries begin to bubble. Meanwhile, for Sauce, mix butter, sugar, eggs, cream and vanilla in a small bowl. Pour or drizzle over the blueberries. Bake another 20 minutes.